Every February 2nd the people of the United States and Canada observe a quirky holiday called Groundhog Day. In the US, the country turns its eyes to Punxsutawney, Pennsylvania to find out whether Punxsutawney Phil, a groundhog, will see his shadow and predict six more weeks of winter. The holiday provides the namesake for a 1993 film in which reporter Phil Conners, brilliantly portrayed by Bill Murray, finds himself in a time loop while covering the events in Punxsutawney. Planning Curiosity's activities on Februrary 2nd, 2018, aka sol 1954 - 1956, felt a little bit like Groundhog Day on Mars. Unfortunately the uplink to the rover for the sol 1952 - 1953 failed, so we unexpectedly found ourselves in the same location as Wednesday. The Sol 1953 part of the plan was planned yesterday and uplinked to the rover early this morning. Never wanting to lose missed opportunities, we made a plan today that will recapture the missing Sol 1952 observations we were hoping to get in Wednesday's plan, and also adds a few new things into the mix given additional time that is available to us. The biggest activity of the plan is setting up to do a SAM geochronology experiment next week. Because this activity will be so power intensive and requires ground in the loop between certain steps, we were not driving in tosol's plan. We will instead do additional remote sensing with our extra time. Besides the SAM preparation activities, the main science in today's plan is focused on characterizing the broken up rocks in front of us, which are the typical targets on the top of Vera Rubin Ridge. We will do MAHLI contact science in the morning of the first sol on targets "Skara Brae," "Glen Roy," and "Drummock." We will also take an APXS observation of Glen Roy and Skara Brae. We have a remote sensing block on the second sol of the plan. In this block, we will collect ChemCam LIBS observations of Glen Roy, "Harra Ebb," and "Cocksburnpath," and an RMI mosaic of "Bloodstone Hill." 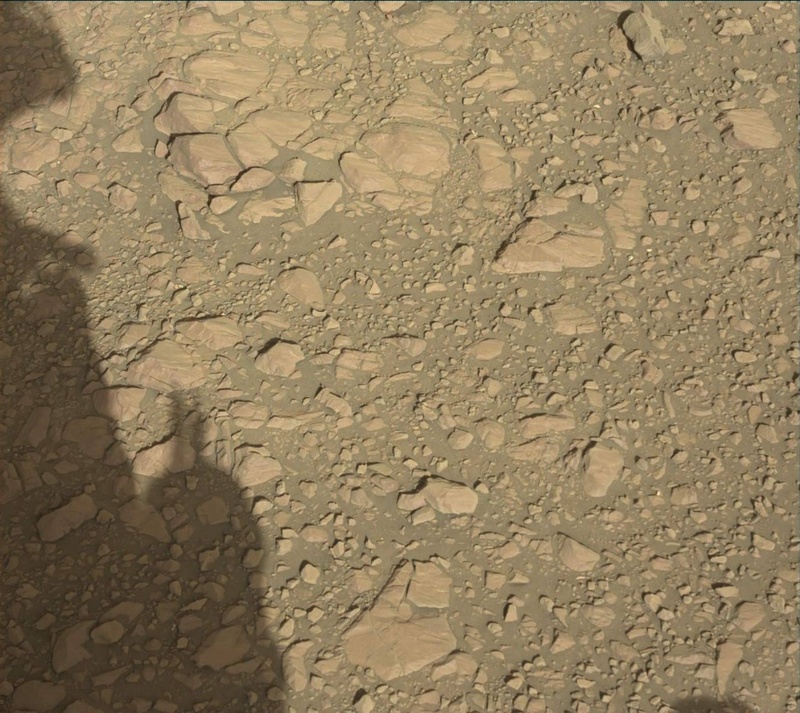 All of the LIBS observations will be accompanied by Mastcam documentation images. We will take additional Mastcam images of two aegis targets from the previous plan, a documentation of our surrounding landscape with multispectral filters, an outcrop named "Scalpay," and a large 37x2 mosaic of the crater rim. The third sol of the plan is a morning science block with a Mastcam tau, a crater rim movie, a Navcam zenith movie, a Navcam suprahorizon movie, and a Navcam 360 degree sky survey.